Therefore, these sulfonate groups do not slow the environmental degradation of the alcohol sulfates. The bisulfite formed is rapidly oxidized to bisulfate by microorganisms. The presence of biodegradable organic compounds in lakes and rivers can result in an environmental problem. Oxygen is required for the microbial degradation of these compounds, and relatively small quantities of organic material can deplete the supply of dissolved oxygen. The amount of oxygen consumed in the microbial degradation of organic compounds can be estimated if the crude assumptions are made that the organic compounds are pure carbon and that they are all converted to carbon dioxide. From reaction (7-25) and the ratio of the molecular weight of oxygen to the atomic weight of carbon, it can be seen that 32/12, or about 2.7 g of oxygen, is required to oxidize 1 g of carbon. Since water can dissolve only about 10ppm of oxygen, this means that in the absence of further dissolution of atmospheric oxygen, only 4 ppm of carbon compounds can deplete all the dissolved oxygen in a body of water. 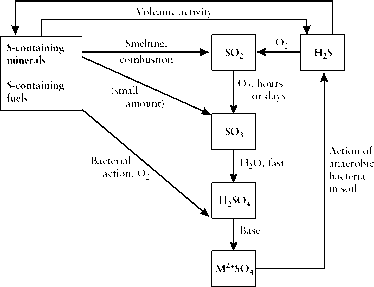 This calculation is an oversimplification because microbial oxidation does not proceed instantly and the oxygen is always being replenished. However, the oxygen near the bottom of deep lakes can be depleted by dissolved organics because of the slow rate of oxygen transport to these low levels (Chapter 9). Fish have difficulty breathing when the oxygen level drops to 5 ppm (one-half the maximum level). Biological oxygen demand (BOD), a measure of the biodegradable organic material in water, is determined by the amount of oxygen required for the microbial oxidation of the dissolved organic content of a water sample. The analysis measures the amount of dissolved oxygen lost from a water sample kept in a sealed container at 2°C over a 5-day period. Chemical oxygen demand (COD) is another measure of dissolved organic compounds. It is determined by measuring the equivalents of acidic permanganate or dichro-mate necessary for the oxidation of organic constituents. Neither BOD nor COD measures the total oxidizable carbon (TOC) content. Total oxidizable carbon is measured by the amount of CO2 formed upon combustion after the water and the carbonate in the sample have been removed. Biodegradable and chemically degradable compounds reduce the oxygen level in lakes and rivers. However, the major sources of dissolved organics in lakes and rivers are the effluent from sewage disposal plants, manure from animal feed lots, industrial wastes, and decomposing plants and algae. Polymers are macromolecules, that is, molecules containing many atoms that are of very large size and high molecular weight (ranging from 10KDa to over 100 kDa). They are made up of a small number of repeating groups. Many macromolecules are components of living systems; examples are proteins, which are polymers of amino acids, and starch and cellulose, which are polymers of cyclic polyhydroxy compounds (sugars). Since biological polymers are built up in living systems, they can typically be broken down by these systems (i.e., they are biodegradable). Biodegradable substances will not cause long-term environmental problems, although the decomposition of large amounts of such materials can be a problem in the short term through their effect on the BOD. In aqueous solution, their degradation will contribute to the biological oxygen demand and use up the dissolved oxygen (see Section 7.2.5). The latex obtained from the sap of rubber trees is apparently an exception to the rule that naturally occurring polymers are biodegradable. The latex is modified by cross-linking and other processes during its formulation into tires, gloves, and other products. These chemical processes increase the strength and durability of the material and also its resistance to biodegradation. Synthetic polymers are made up of a great number of simple units (monomers) joined together in a regular fashion. Some examples are given in Figures 7-3 and 7-4. Many plastic items are not formulated from the polymeric material alone. They may contain lower molecular weight compounds called plasticizers that increase their flow and processibility. Polychlorinated bi-phenyls (PCBs) were formerly used for this purpose, as mentioned in Chapter 8. Esters of phthalic acid are other examples of plasticizers. Fillers, such as wood flour, cellulose, starch, ground mica, asbestos, or glass fiber, are often added to increase the strength of the plastic or to provide bulk at low cost. Heavy metal compounds, including those of tin, cadmium and lead (Sections 10.6.7 and 10.6.10), may be present as plasticizers or to confer resistance to degradation. Plasticizers may be leached or evaporated from polymeric materials in use, while both plasticizers and fillers may contribute to problems of environmental disposal and degradation. The release of PCBs upon incineration of chlorinated polymers is referred to in Chapter 8. Fillers may be inert, but if released as dust during incineration of wastes, they can contribute to atmospheric particulate material. Asbestos particles are health hazards, in view of the known connection between asbestos dust and lung cancer. FIGURE 7-3 Some typical nonbiodegradable polymers and the monomers from which they are formed. FIGURE 7-4 Some typical polymers that are biodegradable under aerobic conditions only and the monomers from which they are formed. Note that a poly(vinyl alcohol) monomer is not formed by the polymerization of the vinyl alcohol but rather by hydrolysis of poly(vinyl acetate).